The start of summer brings with it the beginning of wedding season. 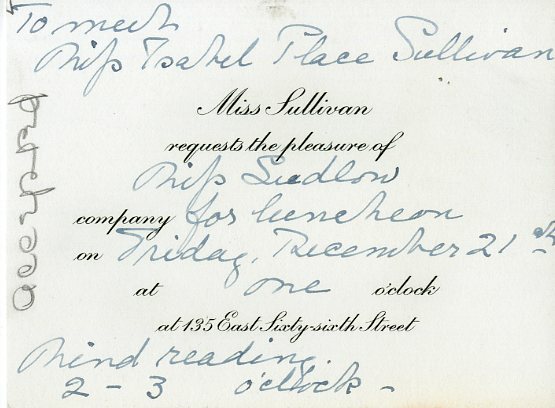 As a bride-to-be myself, I couldn’t help but take a closer look at the numerous wedding invitations that are a part of the City Museum’s Social Events ephemera collection, which I’ve been processing and preparing for digitization in conjunction with the Museum’s National Endowment for the Humanities grant. The invitations represent weddings of many shapes and sizes that occurred between 1821 and 1997. 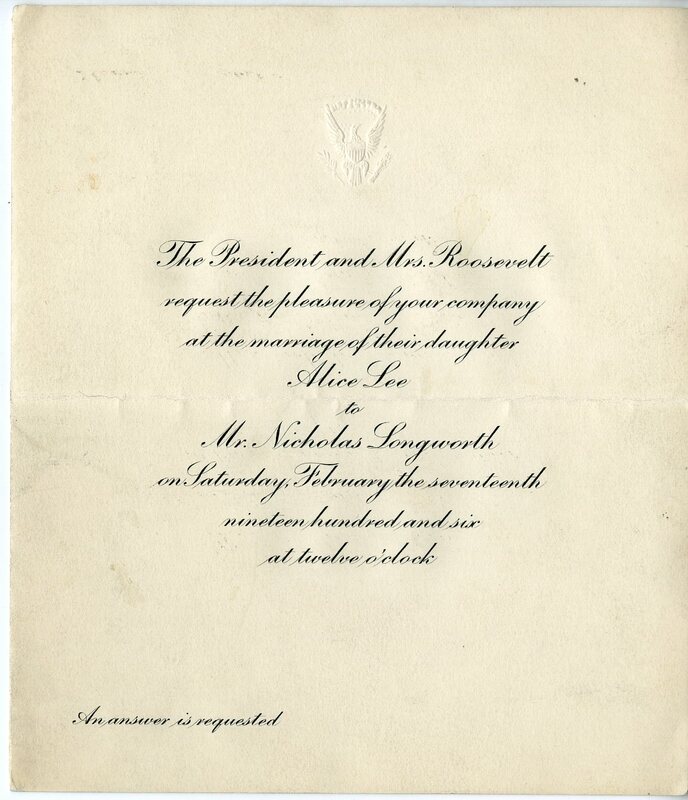 The collection includes a few invitations featuring recognizable names, including Alice Lee Roosevelt, who married Nicholas Longworth on February 17, 1906. Alice was Theodore Roosevelt’s daughter with his first wife, Alice Hathaway Lee, who died shortly after Alice’s birth. Nicholas was a Republican from Cincinnati, Ohio who served in the U.S. House of Representatives, and eventually became Speaker of the House. Their wedding, which took place at the White House, was the social event of the season and attracted 800 guests and many more spectators. The New York Times featured several articles on the sensational event that left no detail undiscussed. One article features two paragraphs on Alice’s dress – white satin accented with lace, ruffles and diamonds – and another two on the flowers – ferns, asparagus fronds, rhododendrons, red carnations and Easter lilies. Click here to view images of the couple on their wedding day. 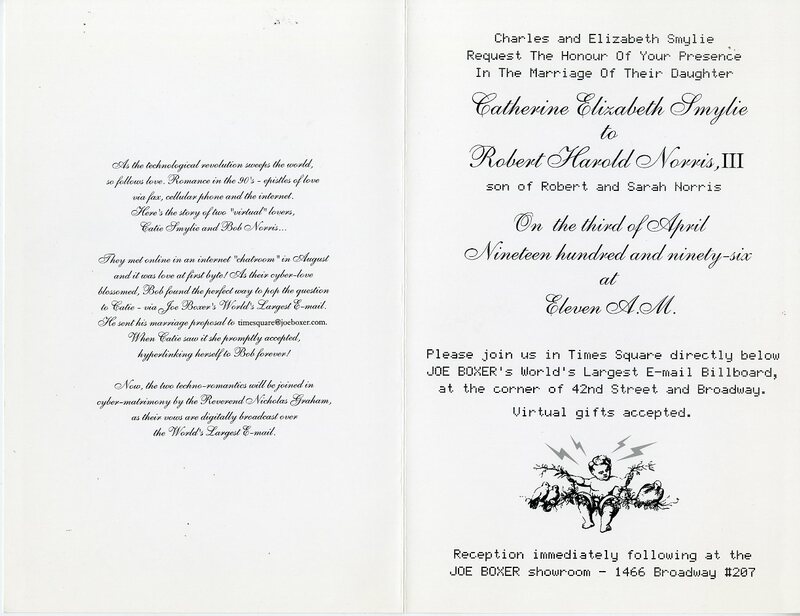 The collection also contains an invitation to another rather public wedding, the “World’s First Digital Wedding” of Catherine Smylie and Robert Harold Norris III that took place in Times Square on April 3, 1996. The couple met in an America Online chat room, and after meeting and dating in real life, Robert proposed by sending a message to “Joe Boxer’s World’s Largest E-Mail,” which was posted on a 100-foot-long electronic billboard in Times Square, along with Catherine’s acceptance. When Joe Boxer, the clothing and accessories company that sponsored the email billboard, heard about the couple’s story the company provided the bride and groom with an all-expenses paid wedding in New York City. Joe Boxer founder Nicholas Graham officiated in Times Square, their vows were simulcast on the Joe Boxer “zipper” board, and the reception was held at the Joe Boxer showroom. Talk about a relic of the 1990s! Another busy period that generally preceded wedding season among members of the New York elite was debutante season. While the practice still exists today in certain circles, in the early twentieth century it was customary for most upper class young ladies to be presented to society at debutante balls to indicate they were now eligible for marriage. 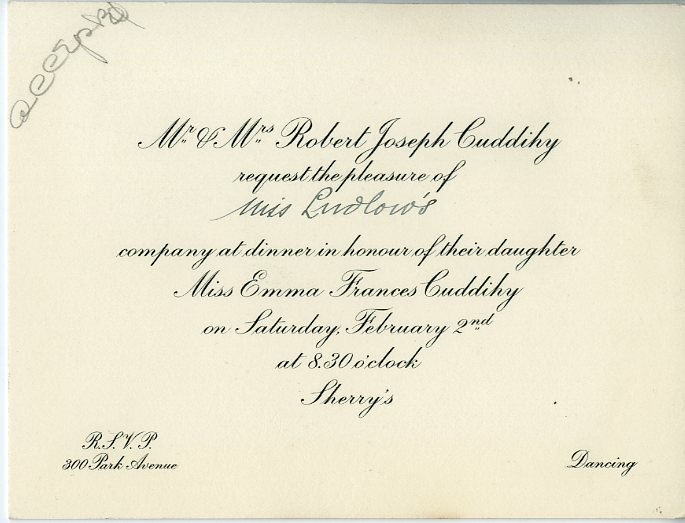 Debutante season in New York traditionally ran from Thanksgiving to the New Year, and the social schedules of those invited to “come out” were packed with lunches, dinners and dances honoring the soon-to-be debutantes. 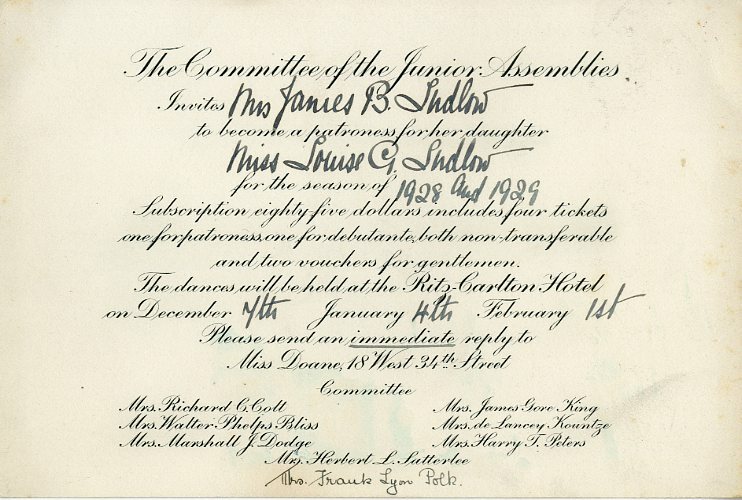 One of New York City’s most prestigious balls was the Junior Assembly, and the Museum’s ephemera collection contains dozens of invitations for the Junior Assembly’s 1928-1929 season – all received by Miss Louisa G. Ludlow. 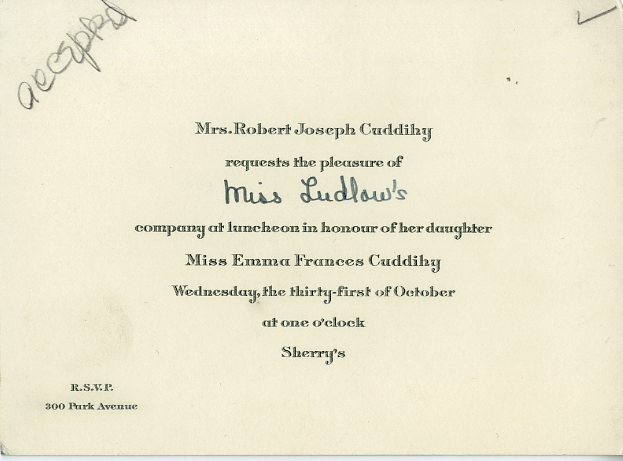 Miss Ludlow was invited to dinners, dances, luncheons (one featuring “mind reading”), theater parties, and teas in honor of her fellow debutantes and noted on each invitation whether she accepted or regretted. Showing no sign of the imminent Great Depression, Manhattan’s top restaurants and clubs, including Sherry’s, the Ritz-Carlton, the Colony Club, and Pierre’s, were popular locations for these events. 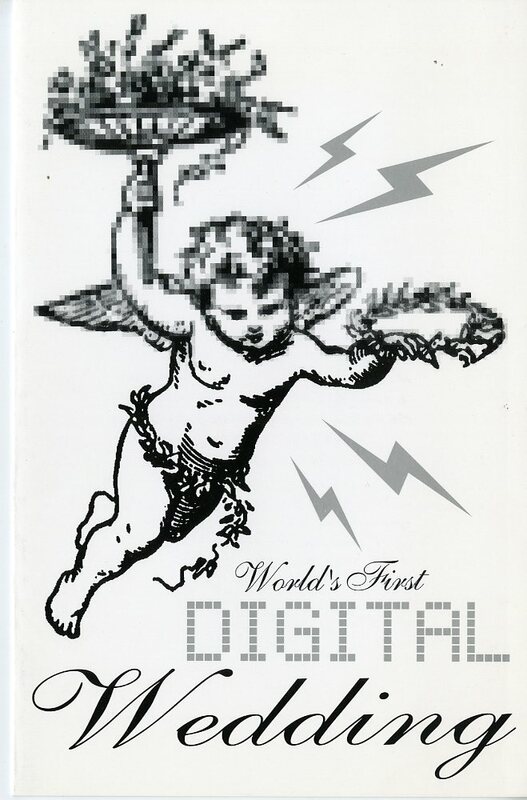 This entry was posted on June 23, 2015 by EmilyC in Digital Project, Manuscripts and Ephemera and tagged 1900s, 1920s, 1990s, Alice Roosevelt Longworth, Chat rooms, Debutante balls, Internet, National Endowment for the Humanities, Nicholas Longworth, Social events, Technology, Theodore Roosevelt, Times Square, Wedding.